It’s always nice to have a quick meal or snack on hand. My husband loves having ready made lunches for work and I love having something ready for lunch or a snack so I don’t have to be busy cooking while my son is awake. I don’t know about you but I think a lot of the food in the freezer section at the grocery store looks really good. But usually it’s too expensive or too unhealthy for me to consider buying so I decided to make my own. The other day I was out with my husband getting a free shake for my birthday from Del Taco. I was hungry so I also got 2 tacos and then I thought why not have taco meat ready to eat at home? So today I made that and another recipe I will share later. 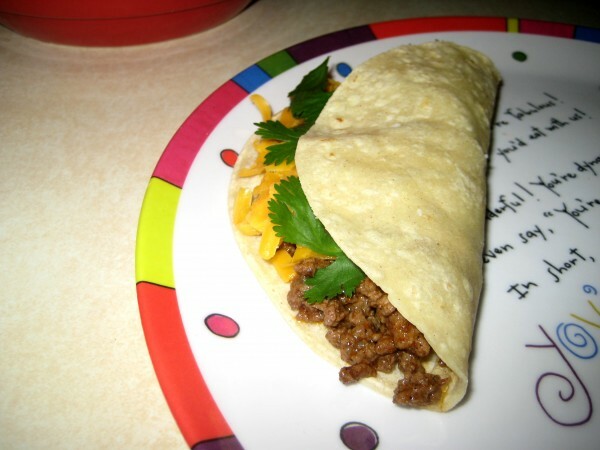 My recipe is adapted from Alton Brown’s All American Beef Taco. Add 2 tablespoons of canola oil to the skillet at medium heat. Once the oil shimmers, add the onion and cook until softened and lightly browned around the edges, about 3 to 4 minutes. Add the ground meat, 1 teaspoon salt, and garlic powder. Cook until browned, about 3 to 4 minutes, stirring occasionally, to break up the meat. Drain grease. Add Taco Potion, water and bouillon cube. Bring to a simmer and cook, uncovered, until sauce is slightly thickened, 2 to 3 minutes. Put all of the ingredients in a small jar and shake to combine. Store in an airtight container for up to 1 month. *Freeze in small ziplock bags enough for one flour taco or 2 corn tortillas, or in bigger portions if you want to use it for a family meal. *You can also put the meat in tortillas and freeze it so it is ready to warm up and eat. Frozen meals are really great! They help me save $ and eat healthily on a really busy schedule. I’m excited for your new blog. James and I will definitely benefit from it. By the way, I never forwarded the message to you that James that your strawberry short cupcakes were DIVINE!! YAY! I’m excited for your new blog and all of your tips for the kitchen….I am in desperate need! I had to come see this post after checking out the pumpkin truffles 🙂 The “first post” always interests me. I’ve been blogging for about a year and a half, and some of those first posts just make me cringe 🙂 If only I knew then…this is a great idea, by the way. We probably eat tacos 2-3 times a month, so it would make sense to put some aside for freezing! Thanks for the idea! haha Yeah first posts are pretty funny! I sill make this recipe though.